Songthaew is the local bus service used by both Thai locals and tourists. Songthaew means two rows, which refers to the two wooden benches that run down either side of the bus, which have been converted from pick up trucks. There is no actual bus stops, to get on a songthaew, you just wait along the roadside until one approaches and you wave it down. These buses are the cheapest way to get from all the main tourist beaches into Phuket Town, costing around 35 - 50 baht, the trip will take around 30 minutes. When you want to get off the bus you need to press a buzzer to signal the driver to stop. This bus service is good for getting into Phuket Town for shopping and back to the beach but they do not go from one beach to another. 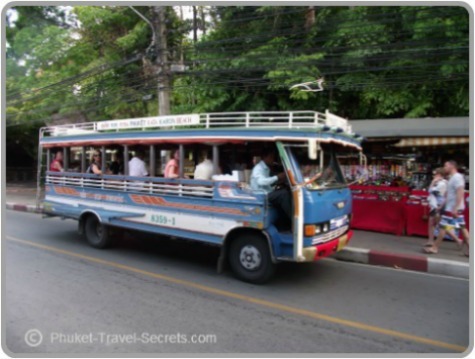 In Phuket Town the buses depart from Ranong Road opposite the Thai airways ticketing office and they run from 7.00 am to 6.00 pm. The main destinations include Patong, Chalong, Karon, Kata, Kamala, Makham Bay, Nai Harn, Nai Yang, Rawai, Surin and Thalang. The Microbus operates in Phuket Town only and have a fixed fare price of 20 baht. These buses are great if you are staying in Town and want to go shopping at the Big C or Tesco Lotus and the best thing is, they are air-conditioned and cheap. This is a daily service that runs from 6.00 am to 8.00 pm. 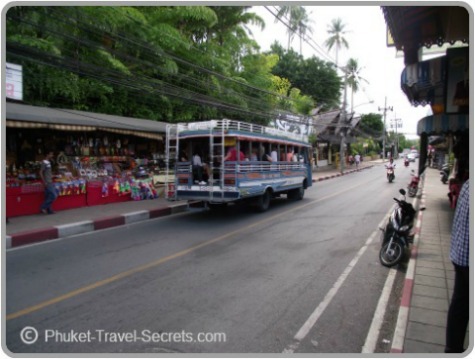 Catching a local Phuket Songthaew bus is the cheapest mode of transport in and out of Phuket Town as well as a great experience, and the microbus is handy to get around within Phuket Town.